Iron-a-aphobia? Don't worry, there's help. Tell me if this has happened to you: You work all day, come home for a quick wardrobe change for a night out (especially on a day like New Year’s Eve) only to find your dress or dress shirt more crinkled than an Ore-Ida — and you don’t have time (or refuse) to iron! What now? Hang it on the door and turn on a hot shower? I think we’ve all tried that. 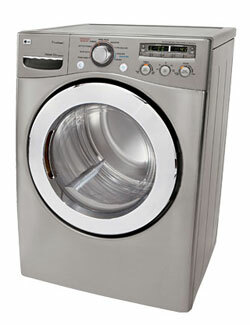 Electrolux EIMD551RR, though I prefer to use its middle name, "Lifesaver." Now I just toss it in my Electrolux steam dryer for a refresh and throw it on 15 minutes later. This one has rescued me so many times. In steam refresh cycles, a small amount of water is sprayed into the dryer drum after several minutes of tumbling with heat. The dryer will continue to tumble at regular heat for the duration of the cycle to reduce wrinkles, static and odors in fabrics. Of course, some fabrics release wrinkles easier than others, but I like prepping heavily wrinkled clothes with a steam cycle so they’re easier to iron. But steam dryers aren’t just for procrastinators/wrinkled-clothes wearers. The LG TrueSteam Dryer (among others) has a SteamSanitary™ cycle, which is NSF certified to eliminate 99.3% of 3 common infectious bacteria. Think of all those decorative pillows, comforters and children’s toys and stuffed animals that can’t be washed, but need to be sanitized for allergy-sufferers and to ward off cold/flu this season. While not cheap, steam models aren’t too much of upgrade from a comparable model, money-wise. The LG steam electric dryer in white is on sale for $999 until Monday, Jan. 4, and the Whirlpool steam electric dryer pictured to the right is on sale for $799 while quantities last. Next week, I’ll be in hot water…talking about steam washers. OK, no more bad idioms until the New Year, I promise 🙂 . Next MN residents: You can get WI stimulus money — now!